CAMBRIDGE, Massachusetts (CNN) -- Lizards with hairy feet are the inspiration for a new medical product that could help surgical patients heal better and might even replace sutures some day. 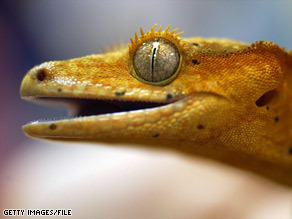 Geckos' remarkable feet are the inspiration for a new kind of bandage. Scientists at Massachusetts Institute of Technology say they have created a new kind of surgical adhesive, formed in a shape that, at the microscopic level, mimics the feet of geckos. Gecko feet are a worthy model to imitate, because the lizards are masters of adhesion -- the force that makes two substances stick together on contact. The nanopillars, one hundredth as thick as a human hair, provide an enormous amount of contact surface, and that leads to remarkably strong adhesion, Karp told CNN. By copying that structure as a shape for their glue-coated polymer, the MIT scientists think they can build a material that will cling tightly to tissue. It will be especially useful for applications inside the body, said Dr. Bob Langer, another researcher on the project, calling it "an internal Band-Aid." "For example, it might be used in holding tissues together that normally couldn't be held together ... say, in hernia repair," Langer said. It could also be used to prevent leaks in gastric bypass operations, Karp said. The new product will be stretchy and will stay stuck even in wet places inside the body, according to the MIT researchers. It can be adapted to different applications and could incorporate antibiotics or other drugs, they said -- like a transdermal patch worn on the inside. It will dissolve inside the body over time, and the scientists can tweak the rate at which that happens, they said. Karp said the new bandage material could be particularly useful in laparascopic procedures, where a surgeon operates through a very small incision. "Our surgical collaborators think that this may even replace sutures one day," he said. "Sutures are very difficult to place within laparoscopic procedures. When working in very small spaces it's difficult to tie a knot." There are medical glues currently in use, but they have some problems, Karp said. "Although they provide very strong levels of adhesion, they are very difficult to work with. They have poor mechanical properties, they are very brittle, and they also induce a very strong inflammatory response," he said. CNN's Ann Kellan contributed to this report.